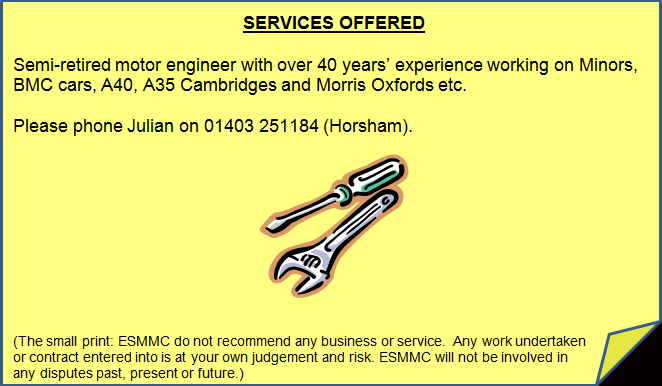 Please note that East Sussex Morris Minor Club do not endorse or recommend any trader, branch or forum. ESMMC will not be held responsible for any disputes between users of this site and any traders, branches or forums listed on this page that they choose to engage with. We are a branch of the National Club. Please visit their very informative website for more information on the club and their activities, including the annual national rally. You don't need to be a member of the National Club to join us though! They also have a very busy forum, so if you're after tips or want to sell your vehicle, we suggest posting there. Our neighboring branch. They hold some great events, and we try to pop along whenever possible; they also attend our events when they can. Please visit their website for further information. 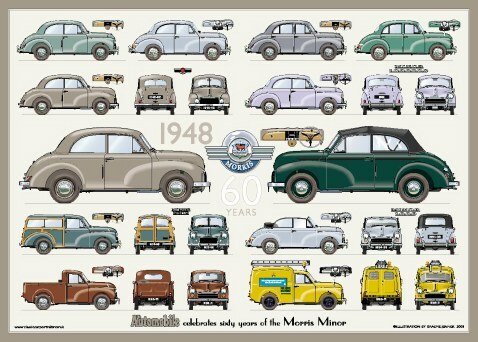 Graeme Jenner produces customised posters of individual vehicles to order, and has all types of classic cars available on his Classic Car Portraits website . These posters are the perfect present for the classic car owner who has everything. The above image is of a poster by Graeme that was the pull-out centrefold in the November 2008 issue of the Autombile magazine. A local supplier of Morris Minor parts. They also carry out restoration work. Please visit their website for information on the spares they can supply, and the work they undertake. MorrisMinorOwners.co.uk Forum. This is a very busy, independent forum. Their website can be found here. Another good place to ask technical advice or post a car for sale.